It’s not often I’m surprised (either positively or negatively) about the quality of clothing I buy. I feel like I’ve done my research with most designers and contemporary brands – I know how they fit, am familiar with the fabrics they tend to utilize – but with less expensive lines it’s much more difficult to determine quality when online shopping. With the exception of BB DAKOTA (specifically this jacket and more recently this easy striped dress – both incredible and under $100!) and a few other inexpensive labels (like all my great Old Navy finds last year – I wear the quilted sneakers and v-neck sweaters constantly), I can usually count on the price to give me an accurate look at how long something is going to last and whether the fabric is going to be icky. I’m not going to name names, but there are a few designers who have less expensive (and more contemporary) lines and the quality is a dramatic drop from the namesake. We’re talking scratchy sweaters, ill-fitting items and outrageous prices for the quality of the goods. One item I’m surprised to have lasted over two years in my closet? This drape blouse (similar here) from Topshop. 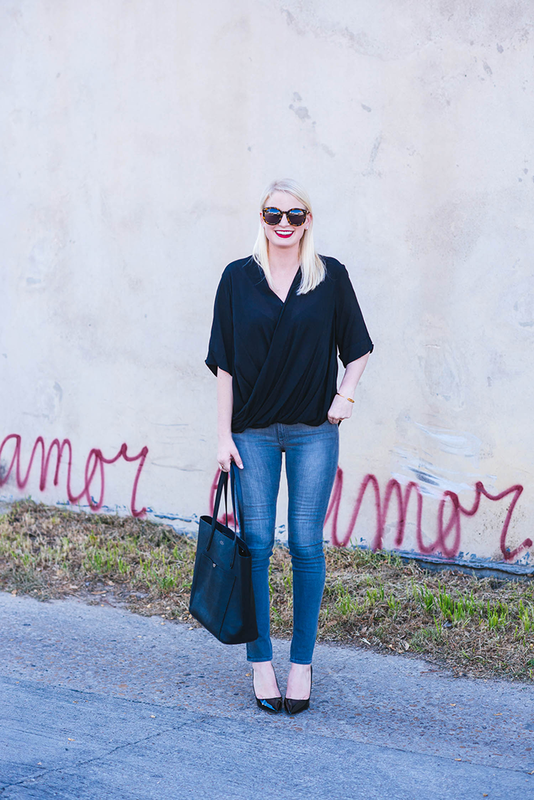 I own it in both black and white, and it is one of my favorite go-to’s when I need a simple outfit for daytime errands during the week or a dinner date with a friend. I believe I purchased the top for $60 originally, which for me, is a total steal! Because I was so pleasantly surprised with the quality and fit, I ordered it in white too. Two years later, I’m still reaching for it in my closet! While this particular top is old/sold out, Topshop had such success with the drape-y style that they recreated it in a bunch of different versions! I’m loving this sleeveless drape blouse for summer and this creamy neutral style. So pretty! love this easy outfit, this top is really a classic. Beautiful look! 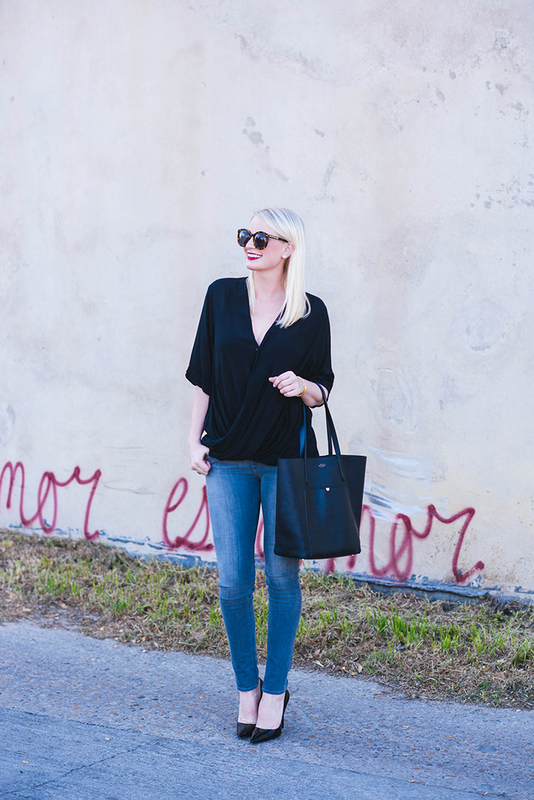 You can’t go wrong with a beautiful black blouse and killer jeans. 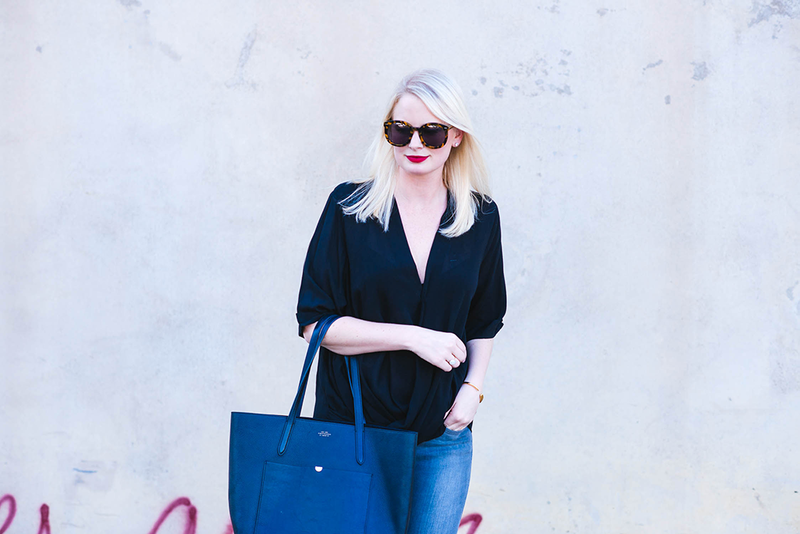 I am a huge fan of BB Dakota and Topshop as well – I know I can count on them for high quality, affordable pieces! Simple, chic, and stylish. Love it! 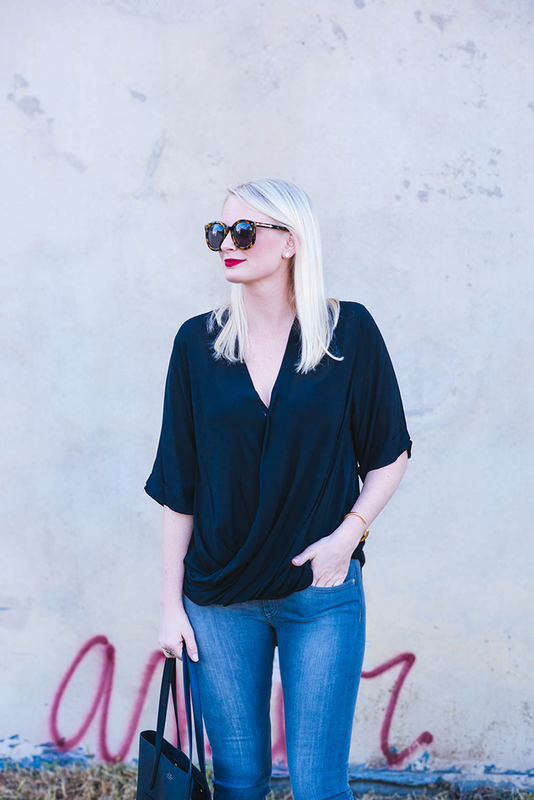 Love the draping on this top! simple and chic. I feel expensive is not always quality, there are brands that are not as popular and costly that are great, and Topshop is certainly one. That top is so stylish and versatile! To me quality in production and material is everything! Obsessed with this from head to toe! Especially love the drapey top. Have a great weekend, Merritt! LOVE this! You look gorgeous – such a chic, simple look. Right up my alley! Loving this top – it fits great! I am beginning to fall in love with Topshop! The prices are great and the items are great! Love your outfit! Adore that bag for Smithsons! I didn’t even know they did totes. It’s a great one to have. you rock the red lipstick! such a cute outfit! This top is gorgeous on you! It’s always nice when pieces hold up well haha. LOVE when that happens, I have a dress from H&M (that I actually stole from a friend) and it has held up incredibly well and looks so great!